We recently received an entertaining email from our loyal customer, Rufus Offor. Rufus is a multi-talented artist and writer from Australia and has the discerning taste to shop at the Emporium Stores. But even the most steadfast of fans can be lured into temptation. Witness Rufus’ confession below. 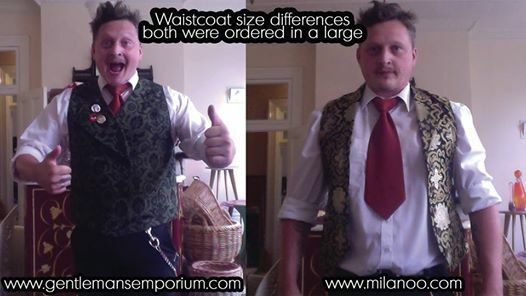 I absolutely adore your site and have bought many waistcoats from you. I thoroughly intend on ordering more but recently I strayed a little and went to a company called Milanoo. Attached is a picture that shows the results. I hope it amuses and I promise to never stray from the righteous emporium path again. Thanks to Rufus for sharing his picture and enthusiasm for our store. If you have a story to share, please let us know.